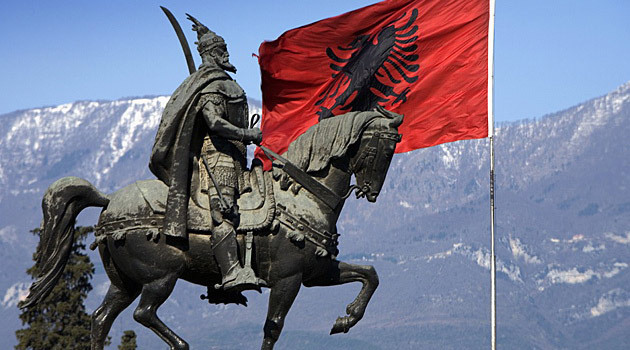 Today is a triple anniversary in Albania, celebrating the first time the black double-headed eagle flag was raised by Skanderberg in 1443, independence from the Ottoman Empire in 1912, and the new parliamentary constitution in 1998. Big one. Here’s a brief history lesson to situate the three dates. Good luck not getting confused. Albania as a semi-distinct region emerged from the pre-history of the Balkan states around 3,000 BCE, in early records of Illyria in Greco-Roman historiography. The modern territory of Albania had no counterpart in the standard political divisions of classical antiquity. Rather, its modern boundaries correspond to parts of the ancient Roman provinces of Dalmatia (southern Illyricum), Macedonia (particularly Epirus Nova), and Moesia Superior. The territory remained under Roman and Byzantine control until the Slavic migrations of the 7th century. It was integrated into the Bulgarian Empire in the 9th century. The territorial nucleus of the Albanian state was formed in the Middle Ages as the Principality of Arbër and a Sicilian dependency known as the medieval Kingdom of Albania. The area was part of the Serbian Empire, but passed to the Ottoman Empire in the 15th century. Ottoman supremacy in the west Balkan region began in 1385 with the Battle of Savra. In the conquered part of Albania, which stretched between the Mat River on the north and Çameria to the south, the Ottoman Empire established the Sanjak of Albania (also known as Arvanid Sancak), and in 1419 Gjirokastra became the principal town of the Sanjak of Albania. Beginning in the late-14th century, the Ottomans expanded their empire from Anatolia to the Balkans (Rumelia). By the 15th century, the Ottomans ruled most of the Balkan Peninsula. 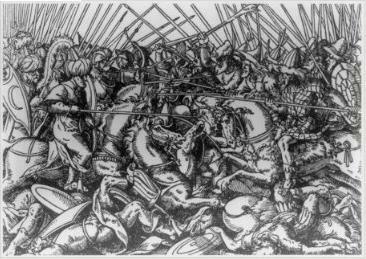 But their advance in Albania was interrupted in the 15th century, when George Kastrioti Skanderbeg, the Albanian national hero who had served as an Ottoman military officer, renounced Ottoman service, allied with some Albanian chiefs forming the League of Lezhë and fought off Turkish rule from 1443–1468 (his death). Skanderbeg frustrated every attempt by the Turks to regain Albania, which they envisioned as a springboard for the invasion of Italy and western Europe. His unequal fight against the mightiest power of the time won the esteem of Europe as well as some support in the form of money and military aid from Naples, the papacy, Venice, and Ragusa. It was during a battle on this date in 1443 that Skanderberg first used the double-headed flag as the nationalist emblem. Three major attacks (Siege of Krujë (1450), Second Siege of Krujë (1466–67), Third Siege of Krujë (1467)) were launched against Albania by the great Ottoman sultans themselves, Murad II and Mehmed The Conqueror. Albania was almost fully re-occupied by the Ottomans in 1479 after they captured Shkodër from Venice. Albania’s conquest by Ottomans was completed after Durrës’ capture from Venice in 1501. Albania remained under Ottoman control as part of the province of Rumelia until 1912, when the first independent Albanian state was founded by an Albanian Declaration of Independence following a short occupation by the Kingdom of Serbia. The formation of an Albanian national consciousness dates to the later 19th century and is part of the larger phenomenon of the rise of nationalism under the Ottoman Empire. 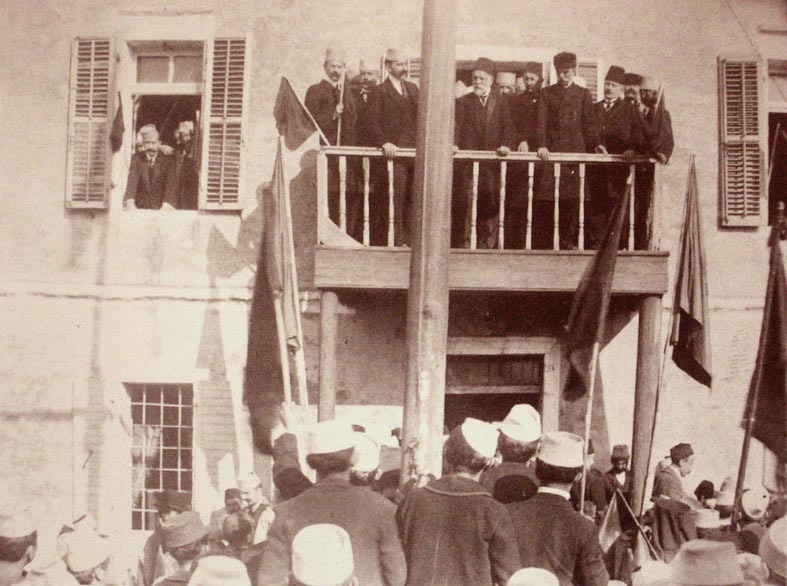 At the All-Albanian Congress in Vlorë on this date in 1912, 83 leaders declared Albania an independent country and set up a provisional government. The official Provisional Government of Albania was established at the second session of the assembly held on 4 December 1912. It was a government of ten members, led by Ismail Qemali until his resignation on 22 January 1914. 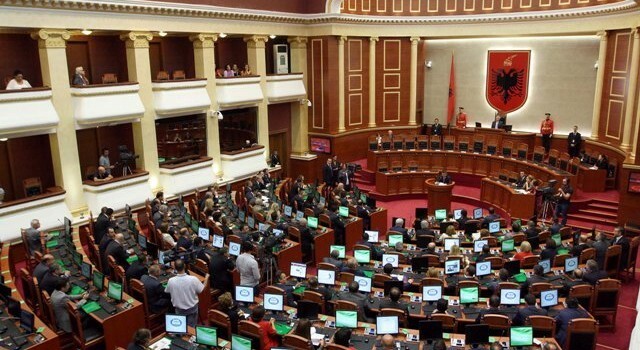 The Assembly also established the Senate (Albanian: Pleqësi) with an advisory role for the government, consisting of 18 members of the Assembly. 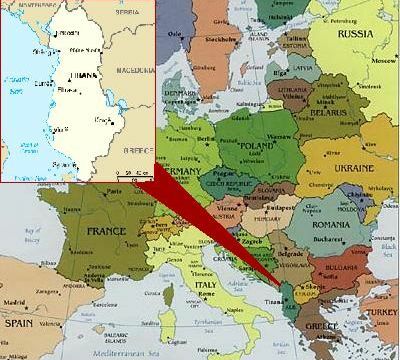 Albania’s independence was recognized by the Conference of London on 29 July 1913, but the drawing of the borders of the newly established Principality of Albania ignored the demographic realities of the time. The International Commission of Control was established on 15 October 1913 to take care of the administration of newly established Albania until its own political institutions were in order. Its headquarters were in Vlorë. The International Gendarmerie was established as the first law enforcement agency of the Principality of Albania. At the beginning of November the first gendarmerie members arrived in Albania. Wilhelm of Wied was selected as the first prince. 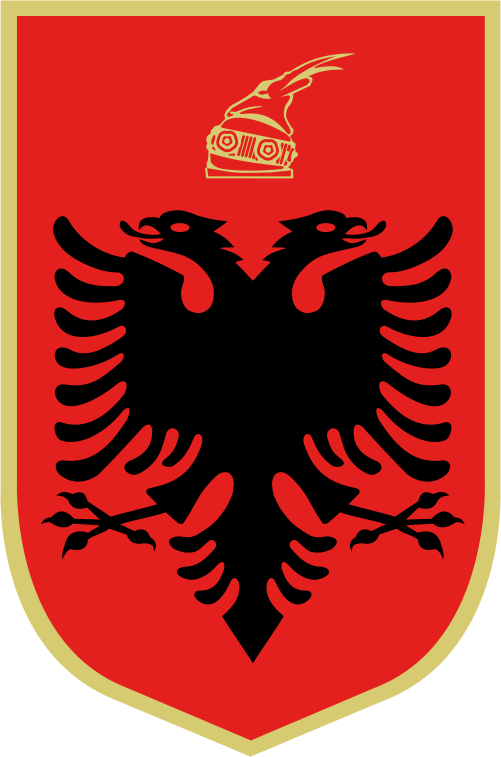 A short-lived monarchical state known as the Principality of Albania (1914–1925) was succeeded by an even shorter-lived first Albanian Republic (1925–1928). Another monarchy, the Kingdom of Albania (1928–39), replaced the republic. The country endured an occupation by Italy just prior to World War II. After the collapse of the Axis powers, Albania became a communist state, the Socialist People’s Republic of Albania, which for most of its duration was dominated by Enver Hoxha (died 1985). 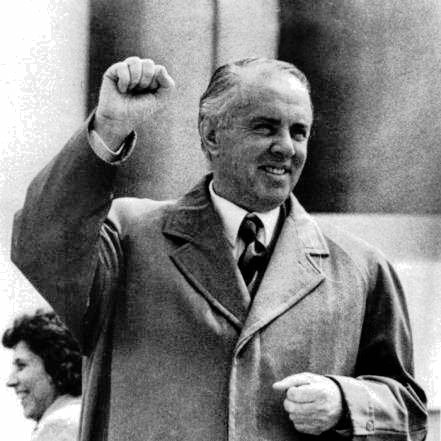 Hoxha’s political heir Ramiz Alia oversaw the disintegration of the “Hoxhaist” state during the wider collapse of the Eastern Bloc in the later 1980s. The communist regime collapsed in 1990, and the former communist Party of Labour of Albania was routed in elections in March 1992, amid economic collapse and social unrest. The unstable economic situation led to an Albanian diaspora, mostly to Italy, Greece, Switzerland, Germany and North America during the 1990s. The crisis peaked in the Albanian Turmoil of 1997. Albanians ratified a constitution on this date in 1998, establishing a democratic system of government based upon the rule of law and guaranteeing the protection of fundamental human rights. Albanians approved its constitution through a popular referendum which was held in November 1998, but which was boycotted by the opposition. The general local elections of October 2000 marked the loss of control of the Democrats over the local governments and a victory for the Socialists. This telegraphic history lesson should give you an idea of the complexity of Albania’s past in political and ethnic terms, which, of course, impacted the regional cuisine. It is a Mediterranean cuisine heavily influenced by Italian and Turkish traditions. Tarator, is a soup, appetizer, or sauce found in the cuisines of all the former Ottoman Empire regions, and is popular in Albania. 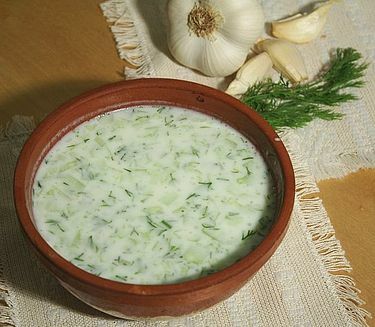 It is cold soup (or a liquid salad), popular in the summer, made of yogurt, cucumber, garlic, ground walnut, dill, vegetable oil, and water, and is served chilled or even with ice. Fried squid is a common accompaniment. Here’s a basic recipe if you need one. Beat the yoghurt with crushed, minced garlic, ground walnuts, freshly chopped dill, finely diced cucumbers, oil, and salt. Dilute with a little cold water, then chill for several hours or overnight. Serve sprinkled with finely chopped dill.